(Natural News) Research suggested that cucurbitacin A found in melons, cucumbers, and other cucumis plants possesses anti-cancer properties that prevent lung cancer growth. A team of researchers from Huazhong University of Science and Technology in China carried out a study that evaluated the anti-tumor potential of cucurbitacin A on non-small cell lung cancer cells. Scientists continue to search for cancer treatments that increase the survival rate and response rate of patients. Cucurbitacins are chemically classified as steroids and are produced by some plant species that belongs to the family of cucurbitaceae of angiosperms. These compounds usually occur in nature in their glycosidic form and act as defense against herbivores. Cucurbitacin A is a variant of cucurbitacins that is produced by some plants — members of the family Cucurbitaceae in particular. Cucurbitacin A is found in some species of cucumis, such as cucumber, muskmelons, horned melon, and the West Indian gherkin. In the study, the research team analyzed the effects of cucurbitacin A on the induction of apoptosis, cell physic, cell cycle failure, and cell signaling pathways. They used MTT and clonogenic assays to examine the effects of the compound on cell cytotoxicity and colony forming tendency in cells. In addition, they used phase and fluorescence microscopic techniques to identify the effects on cell morphology and induction of apoptosis. Moreover, the effects on cell cycle phase distribution were assessed through flow cytometry, while the effects on cell signaling proteins were analyzed through western blot analysis. Results of the study revealed that cucurbitacin A prompted cytotoxicity and suppressed the colony formation tendency of lung cancer cells. These suggested that the compound stopped the growth of the lung cancer cells. It was also shown that the compound encouraged morphological changes in these cells by promoting chromatin condensation, cell shrinkage, and apoptotic body formation. The researchers concluded that cucurbitacin A stops the growth of non-small cell lung cancer cells as it encourages cancer cell death and prevents the proliferation of cancer cells. “In summary, the current results reveal that cucurbitacin A exhibits potent antitumor effects in human A-549 NSCLC (non-small cell lung cancer cells) and these antitumor effects are mediated via apoptosis induction, downregulation of m-TOR/PI3K/Akt signalling pathway and G2/M phase cell cycle arrest,” the researchers wrote. The findings of the study were published in the African Journal of Traditional, Complementary and Alternative Medicines. Lung cancer, also known as lung carcinoma, is the second most common type of cancer and is also considered as the leading cause of cancer death in the United States, with more than 150,000 deaths in 2014. The most common cause of lung cancer is cigarette smoking, which is associated with around 80 to 90 percent of lung cancers. Even if you do not smoke, the smoke from other people’s cigarettes, pipes, or cigars also causes lung cancer, so being in close proximity with those who do smoke also puts your health in danger. Radon, a naturally occurring gas from rocks and dirt, is also a lung cancer risk. It causes about 20,000 cases of lung cancer every year — making it the second leading cause of lung cancer. There are three main types of lung cancer — non-small cell lung cancer, small cell lung cancer, and lung carcinoid tumor. 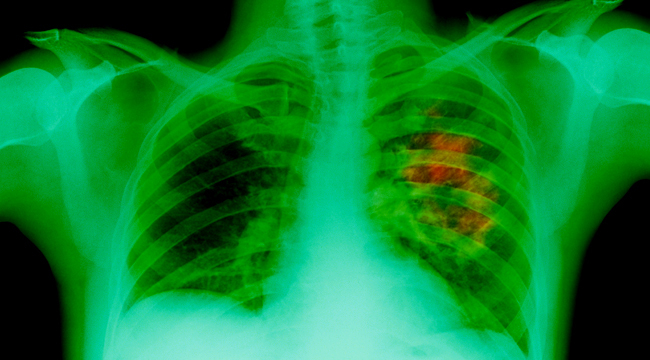 Non-small cell lung cancer is the most common type that accounts for around 85 percent of lung cancers. Small cell lung cancer is also known as oat cell cancer that tends to spread easily, and it accounts for approximately 10 to 15 percent of lung cancers. Lastly, lung carcinoid tumor only comprises less than five percent of lung cancers and it grows slowly and rarely spread. Read more stories on natural cancer treatments at CancerSolutions.news.